In case of any doubt, the rights of unaccompanied child refugees are clearly defined in the European Union regulations that cover how EU member states should treat asylum seekers. And contrary to reports in the media (especially the BBC, which should know better), there is no law that requires refugees to claim asylum in the first safe country they reach. There are, however, obligations under the Dublin 3 Regulation for EU member states to take responsibility for asylum seekers who arrive in their country first. This obligation has been widely ignored during the current and huge refugee crisis. Some EU states, where refugees have first arrived, have not wanted to help, or felt they couldn't help. No wonder so many wandering, stateless people have had to go from one EU state to another, until they could find one that wanted them and could help them. European Commission President Jean-Claude Juncker has promised a reform of the Dublin system. “It is time we prepared a more fundamental change in the way we deal with asylum applications – and notably the Dublin system that requires that asylum applications be dealt with by the first (EU) country of entry,” he said. And the European Council President Donald Tusk said this week that the EU had “no more than two months to get things under control” or face “grave consequences”. As widely reported, the European Commission is expected to propose scrapping the Dublin Regulation rules that state an EU country where an asylum seeker first arrives has to take responsibility for them. But the British government is alarmed by the proposed change. It considers that the Dublin regulation as currently worded works in Britain's favour. After all, the Dublin regulation lets Britain off the hook in having to to take responsibility for asylum seekers. Britain is rarely if ever going to be the first EU country where asylum seekers arrive. Under the Dublin Regulation, Britain can deport an asylum seeker back to the first EU country they entered. ITV News reported today that Britain will oppose changes to the Dublin Regulation. Foreign Secretary Philip Hammond said last night that any changes to the regulations should "protect Britain's interests". Yesterday an Immigration Tribunal, in a Judicial Review, over-ruled Britain's refusal to allow four Syrian refugees, three of them youngsters, to leave the Calais Jungle and join their relatives in Britain. The Tribunal decided that the four refugees should be allowed to leave the appalling conditions in Calais, where they have been living since October, and immediately come to Britain to be with their relatives here whilst their asylum application is processed. The ruling clearly demonstrated that the Dublin Agreement isn't working. 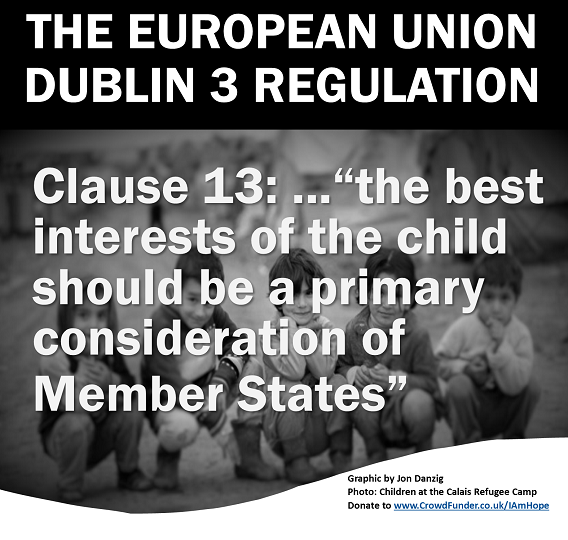 • Under the Dublin Agreement “the best interests of the child should be a primary consideration of Member States” (clause 13). • Under the Dublin Agreement, “respect for family life should be a primary consideration” (clause 14). • Under the Dublin Agreement members of one family should not be separated (clause 15). If the Dublin Regulation was working, there shouldn't be any unaccompanied, stateless, traumatised children living rough for months or more in the abysmal camp known as ‘the Jungle’ in Calais, France - one of the world’s richest countries. If the Dublin Regulation was working, there shouldn't be any parentless, vulnerable, refugee children eking a meagre existence in Calais, when they have relatives in Britain who could look after them. And if the Dublin Regulation was being taken seriously, why is Britain now planning to appeal against the Tribunal ruling to allow those four war-ravaged Syrian refugees to leave their nightmare endurance in Calais and come to Britain to join their relatives? So that those poor youngsters, and others like them, will have to continue their cold, homeless, unloved existence in Calais, far away from home, and yet within reach of relatives who could care for them in Britain? Shame on Britain. Shame on France. • A Community Project called 'I Am Hope For The People At Calais Refugee Camp' is trying to raise funds to provide basic amenities for the men, women and children stuck in the Calais 'Jungle'.